Someone said that the surest mark of a Christian is not faith, or even love, but joy. It is one of the characteristic elements in religious faith as this is described in the bible. The theme of many of the Psalms in the Old Testament is the call to joy “sing out with joy to the Lord, serve him in gladness, come into his presence singing with joy”. In a time of challenges such as those we face in Ireland today, it becomes all the more necessary to turn our footsteps, and so our minds, back to the beginnings. In a time when the Church in Ireland is shaken by wrongdoing, we have come to this place where our Christian hopes, as a people, first were raised. We have come to draw living water from the well of prayer and togetherness, to find a sure basis for joy again in our lives. Even at the best of times, life makes many attempts to deprive us of joy and undermine our faith in God and in each other. Things happen which baffle us, life has problems to which there seems no solution, many questions to which there seems no answer. It is inevitable that doubt, depression and failure of nerve will surface. Life’s dark places challenge us to hold on. While faith is a struggle it is also a powerful instrument in the generation of true joy, enabling us to cling to God so that we do not succumb to denial, cynicism or assimilation. The God in whom we believe is not a distant, indifferent being but rather a partner in free conversation to whom we can speak candidly and who helps to give purpose to our pain and meaning to our muddled world. Pilgrimage affords the opportunity together to make contact with God. Pilgrimage challenges faith and contributes to it. In pilgrimage there is that spiritual dimension, trying to make contact with God and appreciate who we are and where we are located. The Russian Novelist, Aleksandr Solzhenitsyn was a great witness to the dignity of the human person. Speaking of the 20th century he highlighted the contradiction that the century which had begun with robust confidence in the human future quickly degenerated into the greatest period of slaughter in human history. In his 1983 Templeton Prize Lecture he acknowledged the various contributing factors and recognised beneath them all an underlying cause: “men have forgotten God”. In forgetting God people forgot who and what they were and could become. Endeavouring to read the current situation without God is to read history in a shallow superficial way, because God’s search for the human person and the human person’s response to that divine quest is a central reality in our human journey. Not only are God and the human person not in competition; God is with us in the pain and the problems we experience in our everyday life. The Psalmist challenges us in this respect – “what is man that thou art mindful of him or the Son of Man that thou dost care for him” (Psalm 8). A true anthropology and true humanism, speaks of “God – and – the human person”. And this has a liberating effect on the human person enabling us to recognise that we do not inhabit a closed world. Because God is central to our human story, faith in God can and will transform the world. This gives us the freedom and the courage to march to a different drummer precisely because there is another dimension to life, the God dimension that is frequently overlooked. Faith becomes a liberating value. This is something which in our time may be profoundly counter-cultural because a premium is placed on autonomy, doing one’s own thing, self-assertion and self-fulfilment. In such a context faith becomes a challenge as we endeavour to listen and respond to a call outside of ourselves, a call from God. This quite frequently can lead us into conflict with other opinions and the pre-dominant culture. This is not a comfortable place to be and could lead to denial and cynicism but it need not. Pilgrimage places God at the centre. On pilgrimage we have an opportunity to focus on God and take soundings as to whether we inhabit a Godless world or whether with God we can become co-creators in the transformation of the world. Croagh Patrick is a special place of pilgrimage. As we climb the mountain we are in communion with Christ and with one another. We are on a penitential path, deeply conscious of our faults and failures, yet not obsessed by them because we reach out to a merciful and loving God. We are also in communion with one another. On the mountain side we stop and rest on our pilgrim path. We interact with others. We have time to reflect and share with others – it may be a word of encouragement for a pilgrim who may be inclined to throw in the towel and turn back. Isn’t this what life’s journey should involve? We are very conscious of the difficulties on life’s journey, the enormous difficulties besetting our Church, chiefly in the number of innocent people who have suffered through the wrong-doing of some priests. It is understandable that many good and faithful Catholics experience distress and discouragement after the revelations of the mishandling of abuse cases. Many are angered and appalled by what they have learnt. Indeed, these feelings are shared by priests, religious and, yes, bishops too. On our pilgrimage today we bring before the Lord all those who have suffered a betrayal of their trust and a violation of their dignity. In the crucible of suffering it is cold comfort to hear it said, but the reality now is that literally thousands of people, the vast majority lay, are active in our parishes implementing Child Safeguarding measures. Next year the 50th International Eucharistic Congress will take place in Ireland. At the heart of the Congress is the mystery of the Eucharist and never did we need the Eucharist more. It is the Eucharist which nourishes us through the wilderness and the wastelands of life, where no one can survive alone. The Eucharist explicitly links our difficulties with Jesus Christ because the Eucharist is for broken people. When Jesus celebrated the first Eucharist he was a broken and betrayed man. In the broken bread of the Eucharist there is healing. When Jesus therefore feeds us with bread in the wilderness of life he is truly present sharing our sorrows and difficulties, even our temptations and frustrations. Unless we recognise Jesus Christ in one another, we will not recognise him in the Eucharist. The Eucharist enables us therefore to move forward as a community who support one another. And so as pilgrims here today, as a pilgrim and penitent Church we know that we do not travel life’s journey alone. We are travelling with Christ and with one another. We are not alone. The annual Reek Sunday pilgrimage is taking place this weekend on Ireland’s holy mountain Croagh Patrick in the Archdiocese of Tuam. This pilgrimage has been carried out uninterrupted for over 1500 years. Croagh Patrick has over 100,000 visitors annually with up to 20,000 people expected to make the pilgrimage this weekend. Mass was celebrated on the summit from 8.00am and every half-hour thereafter until the last Mass at 2.00pm. The 10.00am Mass was celebrated in Irish and Archbishop Michael Neary, Archbishop of Tuam presided at the 10.30am Mass. Pilgrims were able to avail of the Sacrament of Reconciliation on the summit from 7.30am to 2.30pm on Sunday. The Eucharistic Congress Bell was taken up to the summit of Croagh Patrick by a group of young people from the Archdiocese of Tuam on Friday morning. The Congress bell was on the summit of Croagh Patrick until the end of the pilgrimage at 2.30pm on Sunday 31 July. The Tuam Diocesan Vocations Committee had a marquee at the foot of the mountain to promote vocations and distribute some literature. A special feature is available on www.catholicbishops.ie which includes more detailed information on the annual pilgrimage and a special video reflection by Archbishop Neary on the significance of the Croagh Patrick pilgrimage for people of faith. A virtual tour of the mountain, can be viewed on the website of the Archdiocese of Tuam www.tuamarchdiocese.org and the website of Westport parish www.westportparish.ie also contains additional information about the Holy Mountain. Croagh Patrick, (c.2,510ft/765m) Ireland’s holy mountain, dominates the landscape of southwest Mayo both spiritually and physically. The Croagh Patrick pilgrimage is associated with St Patrick who, in 441, spent 40 days and nights fasting on the summit, following the example of Christ and Moses. The name ‘Reek Sunday’ comes from Patrick’s ability to Christianise many pagan customs including the festival of Lughnasa, which previously had heralded the start of the harvest festival honouring the ancient pagan god Lugh, whose name is encompassed in the Irish word for August: Lughnasa. This festival’s tradition became absorbed into the new Christian beliefs and locally become known as Domhnach na Cruaiche (Reek Sunday). 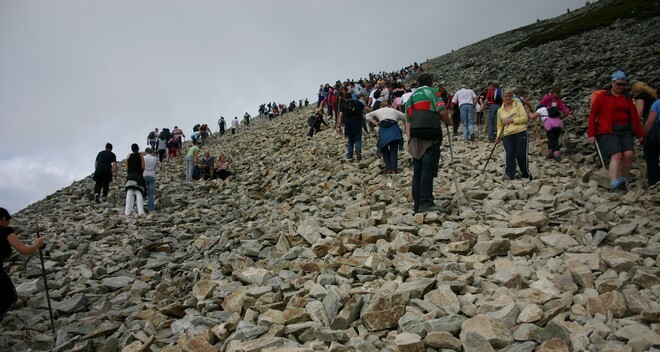 In 2008 in excess of 20,000 pilgrims climbed Croagh Patrick. For the first time in the history of the Reek, Mass was televised live from the summit and broadcast on RTÉ television and on the world-wide web. For Reek Sunday 2006, Archbishop Neary and other pilgrims were accompanied by Cardinal Seán Brady, Archbishop of Armagh and Primate of All Ireland. As successor to Saint Patrick, Cardinal Brady was the first Archbishop of Armagh to climb the Holy Mountain since Saint Patrick. In 2005, Archbishop Neary unveiled a plaque to mark the centenary of St Patrick’s Oratory on the summit.